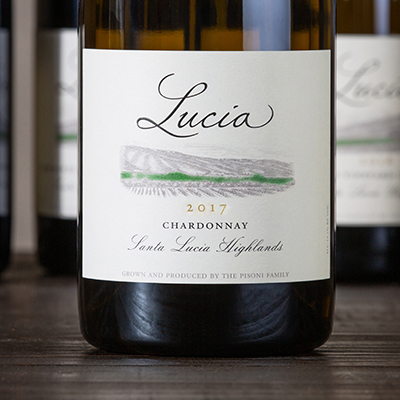 A deliciously pure blend of 45% Pisoni and 55% Soberanes vineyards, the 2017 Lucia Chardonnay exhibits both power and elegance. Generous notes from Pisoni Vineyards combine with lemon curd, peach, baking spice, Golden Delicious apple. These aromas intertwine with layered richness and an expansive palate. Soberanes stakes its claim with hints of crushed rock and orange blossom, culminating harmoniously with a seamless, long, and textured finish.